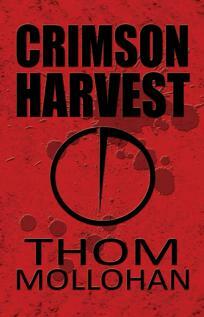 Crimson Harvest by Thom Mollohan is a suspenseful and fast-paced novel that reflects spiritual truths and the struggles of many Christian-raised teenagers. This quick but exciting read merges fantasy and reality in the story of an average teenager with spiritual struggles, and bloodthirsty monsters of an ancient evil. The book follows the story of Heather, a sixteen-year-old girl from a Christian home, who is pressured by her friend Jillian to rebel against her parents and her morals. When Heather finally breaks and agrees to sneak out to a club with Jillian and her handsome and charming new friend Gage, she gets far more than she bargained for. After witnessing Gage brutally attack (and possibly murder) Jillian and her brother Rich, Heather flees home and seeks the help of her parents and Uncle Kevin. Heather starts to see that there is a much deeper evil at work as she tries to flee from Gage, who is out to kill her, and save Jillian, who seems blinded by Gage’s lies. In spite of a random attack on her parents, Heather gains a deeper understanding of God’s love and protection. With her parents hospitalized, and still no idea of how to escape from Gage, it seems to Heather that Gage has an evil and inhuman hand in everything that goes on in her town. Wooed by a cry of help from Jillian, Heather is kidnapped by some of Gage’s followers, and even the police are involved. It is now up to Uncle Kevin, himself not a Christian, and Officer Logan Sharptwig, seemingly the only man on the police force who can be trusted, to save Heather before it’s too late. Heather’s character transforms from a spiritually insecure girl who just wants to have fun into a young woman after God’s heart. Mollohan uses this action-packed story to demonstrate the importance of an honest relationship between Christian teens and their parents, having a strong church family, and learning to rely on God’s love. Mollohan’s approach to Heather was realistic, exposing the inner struggle for good decision-making, despite her relationship with Christ. This story also reminds us that making mistakes doesn’t mean an end to our relationship with God. The narration of Heather’s feelings of shame for going to the club makes a realistic connection to the struggle of many teens in similar situations. Even if cheesy at times, the story was involving and the message moving. A great way to connect with a teen in the rebellious years, this encouraging story with page-turning suspense is ultimately a message of God’s love.